The Mazda CX-9 mid-sized three row SUV comes equipped with a 250 hp, 310 lb-ft turbocharged 2.5-liter inline-four which powers all four wheels through a 6-speed automatic transmission. Fuel economy levels are commendable and performance and handling are superb for the class. Interior space and practicality levels are not so stellar and trail the best offerings in this segment. Equipment levels are good though and even the lower trim levels come fitted with LED headlights and rear cross traffic alert systems making the CX-9 a strong competitor overall. A family emergency quickly blew up what was meant to be an average weekend. We had three hours to drive from Orlando to South Florida with the 2018 Mazda CX-9 as our chariot and we predicted that this three-row crossover would simply be a comfortable family hauler that would get us from point A to point B. Along the way we discovered that this was no typical three-row crossover. Mazda built the CX-9 for people who love driving. This revelation came as a bit of a shock. The CX-9 plays in a category that isn’t exactly known for being “sporty.” It competes on the small end of the three-row crossover market, which includes models like the Chevy Traverse, Ford Explorer, Honda Pilot, and Hyundai Santa Fe among others. These crossovers are marketed towards budding families to carry around their 2.5 children and their friends with plenty of cup holders to go around. 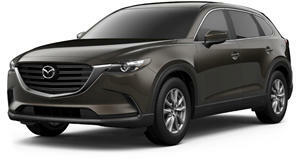 The latest CX-9 with Mazda’s first-ever turbocharged SkyActiv engine. This 2.5-liter four-cylinder makes less horsepower than the 3.7-liter V6 it replaces, but a whole lot more torque. In total, this powerplant produces 250 horsepower and a whopping 310 lb-ft of torque. Those were V8 numbers not so long ago. The 2.5-liter turbo four is the only engine option, which puts it at a roughly 40 hp disadvantage over its aforementioned V6 competitors. The biggest advantage of dropping two cylinders is increased fuel economy. Mazda says the CX-9 will achieve 20/28 mpg city/highway with front-wheel drive or 20/26 mpg city/highway with all-wheel drive. Our AWD tester was able to match and exceed its rated figures. The CX-9 starts at a reasonable $32,130, but our loaded up Grand Touring model with AWD came out to $42,905. The CX-9 is one of the most expensive cars in its class, but Mazda makes up for this by offering a near-luxury interior and a ton of standard features, such as three-zone automatic climate control, push-button start, blind-spot monitoring, and rear cross-traffic alert. Its interior is constructed of quality materials and has few hard plastics. Our Grand Touring model came with even more niceties, such as heated leather seats, real aluminum trim, head-up display, 2nd row sunshades, a Bose 12-speaker audio system, and an adaptive radar cruise control system that can bring the car to a full stop in heavy city traffic. The CX-9 is one of the best looking crossovers in its segment thanks to the Kodo design language that was first shown on the Mazda 6. 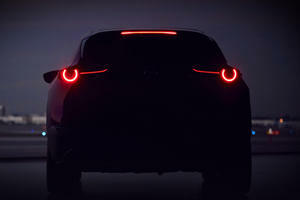 Our only gripes with this particular iteration of the design language are the headlights and taillights, which look a bit small for a vehicle of this size. Anyone who has sat in a Mazda 6 or even a Miata will feel right at home here. This is both a compliment as well as a point of contention. We had the chance to recently and one of our few complaints was a slightly cramped interior. On a small, two-seater car, this isn’t such a big deal, but it is a massive oversight on a three-row crossover. Even at 5’8”, we found ourselves bumping our knees on the large center console while driving. Cargo space is around 38 cubic feet with the third row down, but shrinks to only 14 cubic inches with the third row up. This is smaller than the Explorer and Pilot. Legroom in the rear was ample, aided by a sliding bench that made for easier access to the third row. Unfortunately, seat controls for the second and third row seats are manual with no power option. The third row is relatively usable for passengers under six feet, but getting the most room requires sliding the second row forward, which eliminates second-row legroom. Owners will find the CX-9 is best for five passengers with occasional third row use. Mazda seems to have focused less on family friendly options such as rear-seat entertainment and vast amounts of storage compartments and instead focused on making the CX-9 fun to drive. We have reviewed several new Mazda models, and we can confirm that the company makes some of the most fun-to-drive cars in nearly every segment. 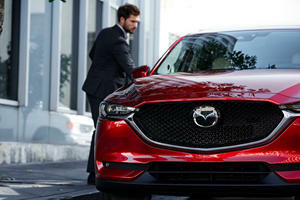 The Mazda 6, for instance, offers some of the best steering feel and driving . The CX-9 is no different amongst its three-row crossover peers. We expected such a large crossover to have light and easy steering, but it was heavy and direct just like a Miata. This is welcomed on a sport car such as the Miata, but felt out of place in the CX-9. We noticed a fair bit of body roll through the corners (as any SUV would), but its direct steering made it a joy to toss around. Maybe Mazda designed the CX-9 for a parent dead-set on buying a new Miata, but who just found out they were about to have triplets. This is an interesting product mission in a segment that doesn’t offer a “driver’s” model. The turbocharged SkyActiv engine did a nice job motivating the 4,300-pound behemoth up to 60 mph in 7.2 seconds. While 250 hp doesn’t sound like much for a car this size, its 310 lb-ft of torque made up for it. Our only gripe with the drivetrain was the six-speed automatic transmission, which doesn’t really cut it in today’s market. Gearshifts are smooth once the car is up to speed, but the acceleration can be jerky from a start. The CX-9 took premium fuel, but Mazda says the engine can run on regular in exchange for a 23-hp loss. Once the CX-9 was up to speed, especially on the highway, we could make use of that massive torque to pass people without the need to downshift. This engine almost felt like a diesel, which is a huge compliment in terms of providing effortless passing power. 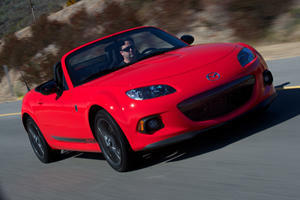 We’d like to see Mazda incorporate an eight or even 10-speed automatic that can take advantage of the torque. We appreciate Mazda wanted to make the CX-9 fun, but we aren’t sure the target market is really looking for a canyon carver. That heavy steering was great for tossing the CX-9 around a back road, but it also made it cumbersome to park in a tight spot. Mazda should have focused less on those impeccable driving characteristics and instead put more energy into fixing some of our issues with the infotainment system. The system isn’t hard to use thanks to a BMW iDrive-style controller. The system can also be controlled via a touchscreen, but it forces drivers to use the controller when the car is in motion. The CX-9 read text messages aloud, but the system was easily flummoxed when two texts came in at the same time, which caused it to display the wrong names. Its voice control was equally frustrating. Our simple command to “call Dad” came up with at least five results, none of which were even remotely correct. There are two simple answers to all of these problems: Apple Car Play and Android Auto, which Mazda does not currently offer. Mazda is reportedly working on an all-new infotainment system in partnership with Toyota that should be an improvement. Hopefully Mazda can fix some of its issues, but we don’t understand why the Japanese automaker didn’t include the Apple and Android systems like so many other automakers have done. If you are looking for a three-row SUV, but had your heart set on something sporty, the CX-9 is the crossover you should consider. The CX-9 places a heavy emphasis on driving dynamics, but we just aren’t sure it is what three-row crossover buyers actually want. We’d like to see Mazda update the CX-9 with lighter steering, an eight-speed transmission, and Apple CarPlay and Android Auto integration. With these additions, the CX-9 would be one of the most well rounded competitors in the three-row crossover segment. Could it be a reborn nameplate from the recent past? Why trade in your car only because of its old infotainment system?